Solution Second has been and continues to be involved in many exciting web sites and internet projects. Below we proudly display and detail our work. 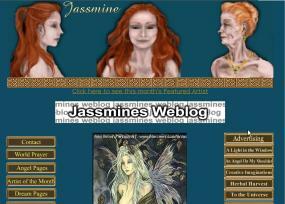 Jassmine had a problem, she had seven unique and popular ezines which were in a mess. Working closely with her we combined these ezines into one site, gave all the ezines a common stylish yet simple look and easy to use navigation system. Using PHP and CGI scripts services for other ezine publishers have also been merged into the Mother Earth Publishing site. Designed, developed, maintained and hosted by Solution Second. Judi Singleton of http://www.jassmine.com and http:/www.gotojassminesitenow.com had this to say about our services: "I have been using James services to both install and write cgi for me for about a year now. He is efficient, has the job done in no time flat. If you want top notch service James is the person to use. We all need cgi it is the backbone of our companies. Get your custom planning and scripts from James you won't be sorry. " Implemented the industry standard Merchant Order Form script to ecommerce enable client's web site http://www.mrmodels.co.nz. Required setting up of script, design of templates, custom shipping programming and design of purchase and security procedures. All credit card details are secured by 128bit Secure Socket Layer (SSL) and are encrypted from source to recipient. Ecommerce and security systems implementation by Solution Second. Implemented the industry standard Merchant Order Form script to ecommerce enable client's web site http://www.nzleather.com. Required setting up of script, design of templates and design of purchase and security procedures. All credit card details are secured by 128bit Secure Socket Layer (SSL) and are encrypted from source to recipient. Ecommerce and security systems implementation by Solution Second. This site was recently advertised on television. Jassmine wanted her users to be able to setup their own free web logs and also to sell various web hosting packages to her visitors. Working with her to develop the concept, an appropriate cgi script was chosen that fitted her needs. This was modified extensively and integrated into an attractive and functional web site design. Web site design, cgi script customisation and integration by Solution Second. Implemented the industry standard Merchant Order Form script to ecommerce enable client's web site http://www.heavensent.co.nz. Required setting up of script, design of templates, custom shipping programming and design of purchase and security procedures. All credit card details are secured by 128bit Secure Socket Layer (SSL) and are encrypted from source to recipient. Ecommerce and security systems implementation by Solution Second. Setup to provide interactive physiotherapy information and services to the UK profession Urielonline was a complex challenge. Programmed entirely and from scratch in PHP and MySQL the site has many unique features. An integrated password and member system gives qualified professionals access to advanced case study, research and professional interest areas. Members are encouraged to contribute to the site which can be effortlessly managed through an extensive and unique administration system. Designed, developed, and maintained by Solution Second. Lynne Norris of Norris Business Solutions had this to say about her new web site.James was absolutely amazing. I had a basic idea of what I wanted and he worked with that idea and created a fantastic site for me. I will be working with James again in the very near future. I would recommend him to anyone that wants a great web site designed and someone that is very easy to communicate with and work with. Design and programming for 640x480 screen resolution by Solution Second. 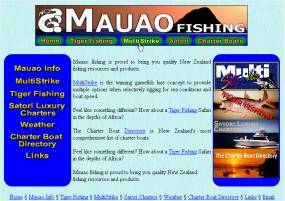 Mauao fishing needed to integrate their four diverse fishing related businesses into a single effective website. We worked with their existing content and offline promotional material to develop an attractive and consistent site that remained easily navigable. Sadly the design and web site is no longer in use due to a change in business focus by the client. Site design and web graphics by Solution Second.